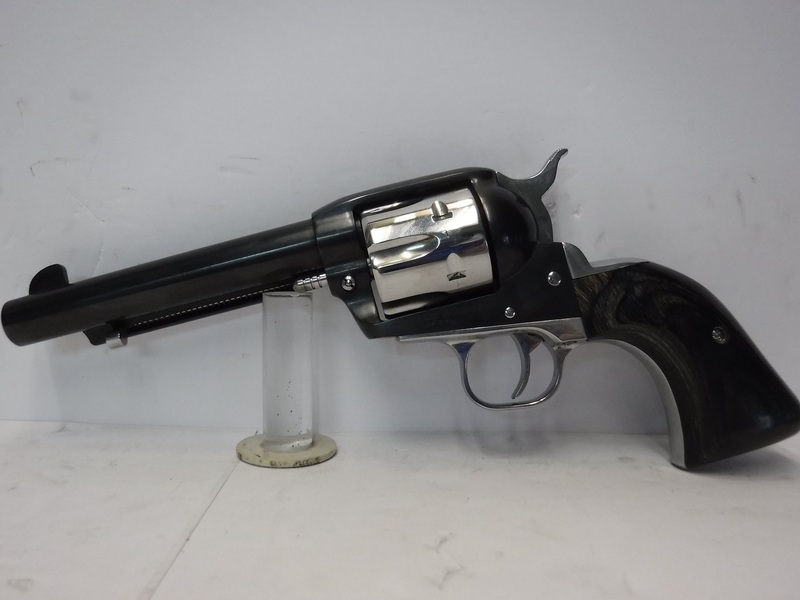 This is one of our semi custom Vaqueros in 45 Long colt. 5½" barrel, full action job. Two toned with stainless cylinder, gripframe, hammer & trigger and small parts. 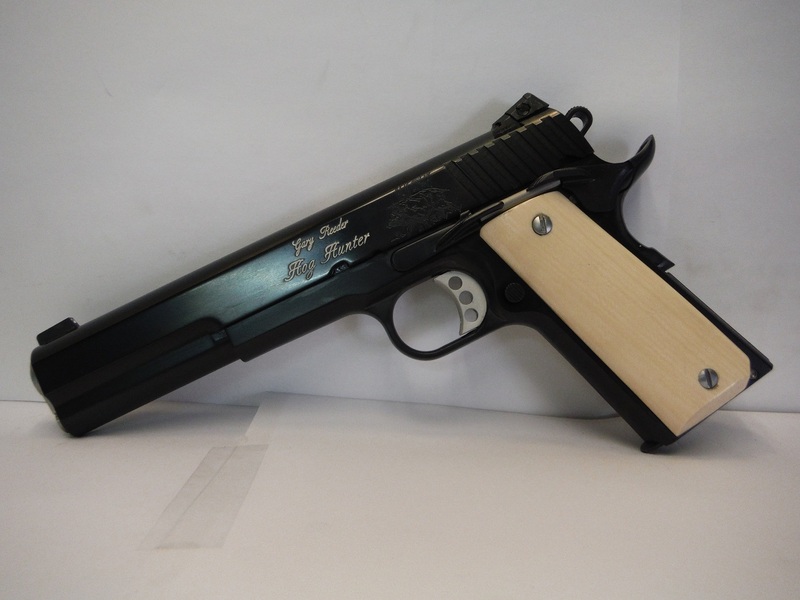 Laminated grips on the Gunfighter Grip. Satin Black Chromex on the rest of the gun. 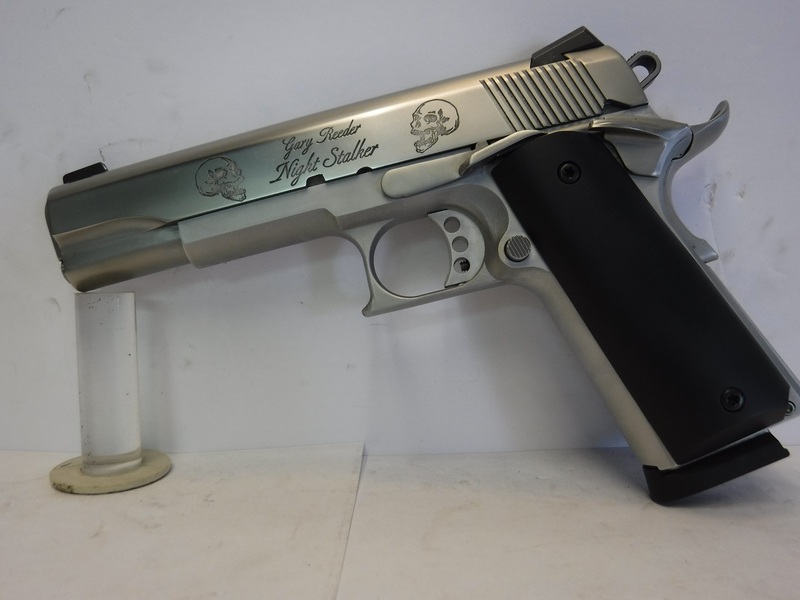 The gun is full custom and has everything the full custom gun has except the full engraving. The normal price on this one is $1695 but is sale priced at $1195 plus shipping. 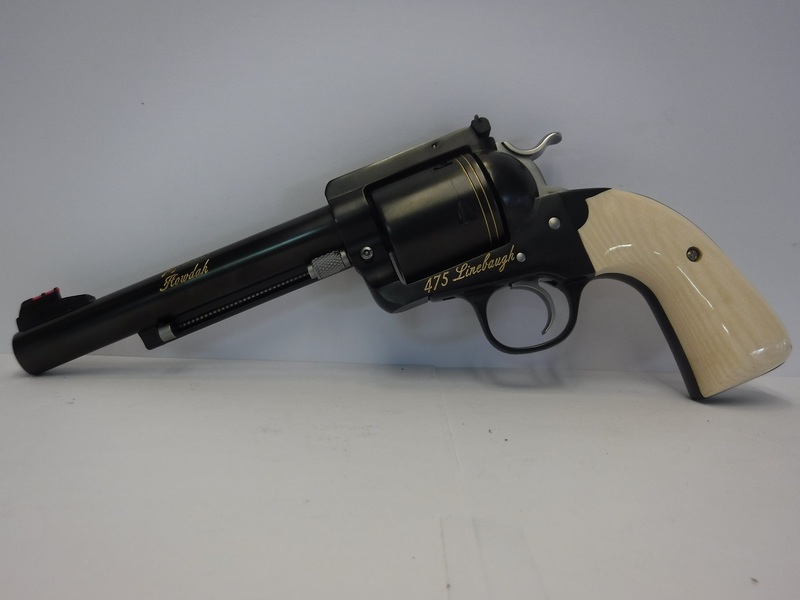 This is one of our very special and very popular Howdah revolvers. They are built from the ground up on one of our beefy frames. This beauty is chambered in 475 Linebaugh. It is lucky number 13 and has a 6½" barrel and has the interchangeable blade front sight with the red fiber optic blade. it has had the Positive Performance Package and is very accurate and very smooth. 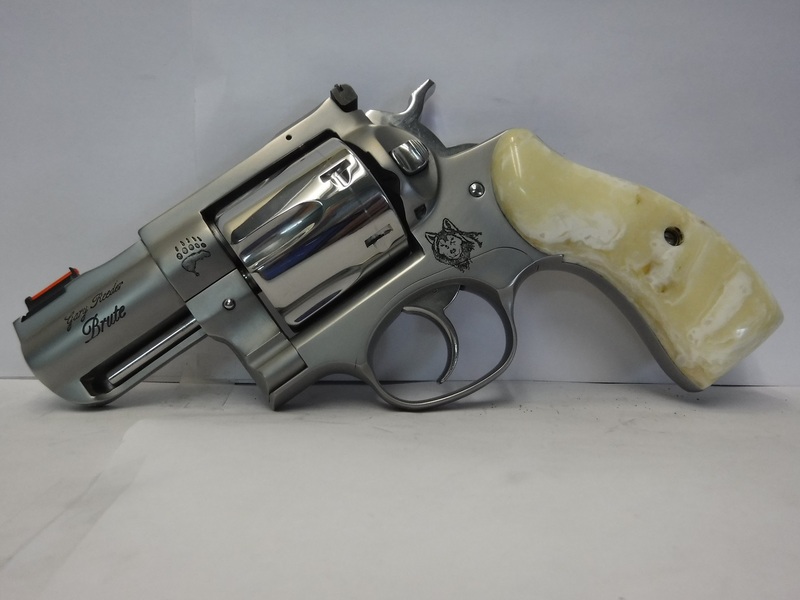 It has the Bisley Gunfighter Grip with a real nice set of Ivory Max grips. The gun is finished in our soft satin Vapor Honed Black Chromex with gold accents. It has the Belt Mountain base pin for a stronger lock up. It has been our display gun for several months and a lot of folks have drooled over it and handled it, but it has not been shot other than me or Nate here doing the test firing of it. The gun may have a few very small handling marks on it so I have marked it down a bit. Normally it takes 8 to 10 months to get one of these but you can get it right now and save a bit too. The gun is priced at $1895 plus shipping. This is one of our Semi Custom 44 Magnums. This one is a 4 5/8" 44 Magnum on the Ruger Super Blackhawk. It has the Positive Performance Package and is smooth and accurate. It has the Gunfighter Grip with laminated black grips.It has the Belt Mountain Base pin for a tighter lockup. It is finished in the satin Vapor Honed stainless with satin Black Chromex small parts. It has everything a full custom gun has except the engraving. With us furnishing the base gun it would normally run around $1700 but is sale priced at $1295 plus shipping. Next we have a brand new Night Stalker in 45 ACP. This one is custom from the ground up and every part is custom. Extended safety, extended slide release, custom trigger, custom sights, custom beavertail and a lot more. It is satin stainless with satin black Corian grips. It would normally be around $1900 but is sale priced at $1295 plus shipping. 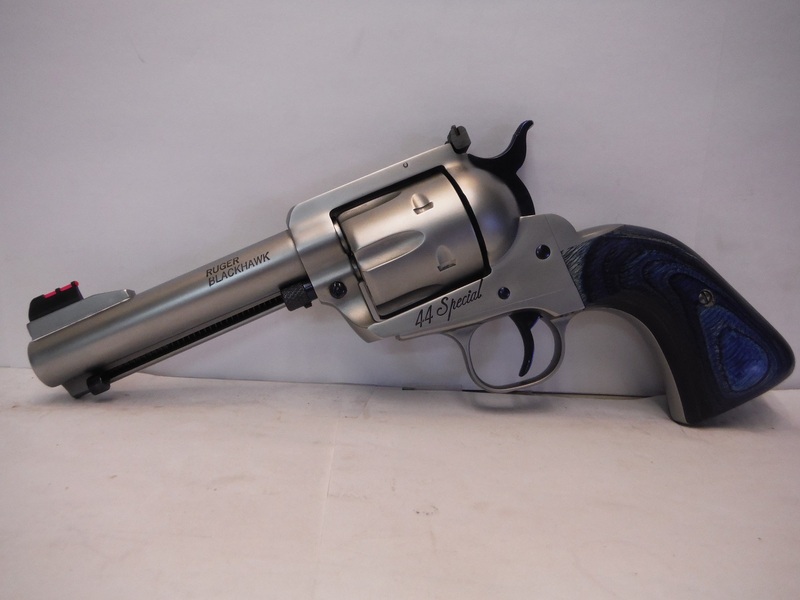 This is one of our very popular Brute revolvers. The gun started out as a standard Ruger Redhawk. It now has a 2" barrel, full re-contouring of the frame to remove the sharp rear edge of the frame, rechambered to 429 GNR, Gunfighter Grip top and bottom of the gripframe and with a custom set of Corian aged ivory grips. The gun has had a full Positive Performance Package and is very smooth and accurate. The gun is finished in our satin Vapor Honed finish with the small parts high polished. The 429 GNR is extremely powerful and is my personal choice for a back up revolver in dangerous game country. The portability and power of this revolver makes this new Brute one of the perfect back up guns made. It is normally $1695 on the customer's base Redhawk, but with us furnishing the Redhawk it would normally run well over $2600. It is sale priced at $1795 plus shipping. 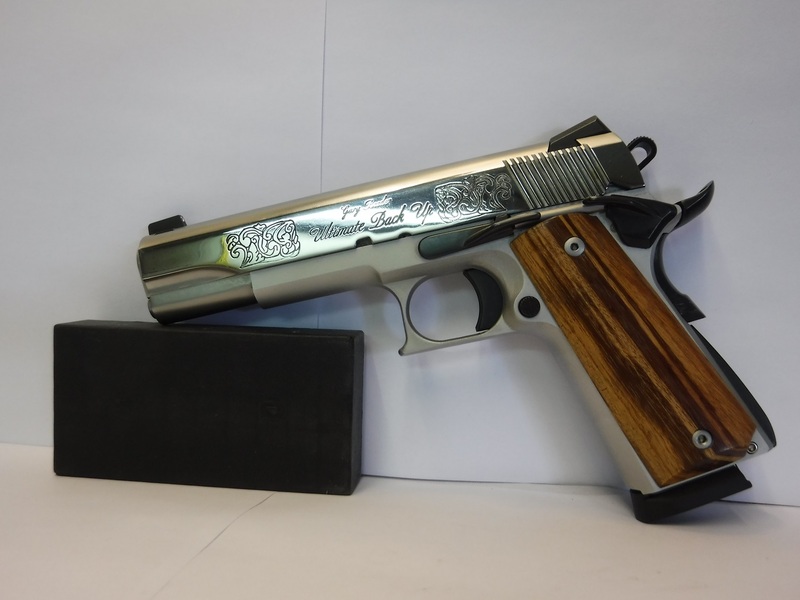 This is another full custom 1911 in 45 ACP and another one built from the ground up. 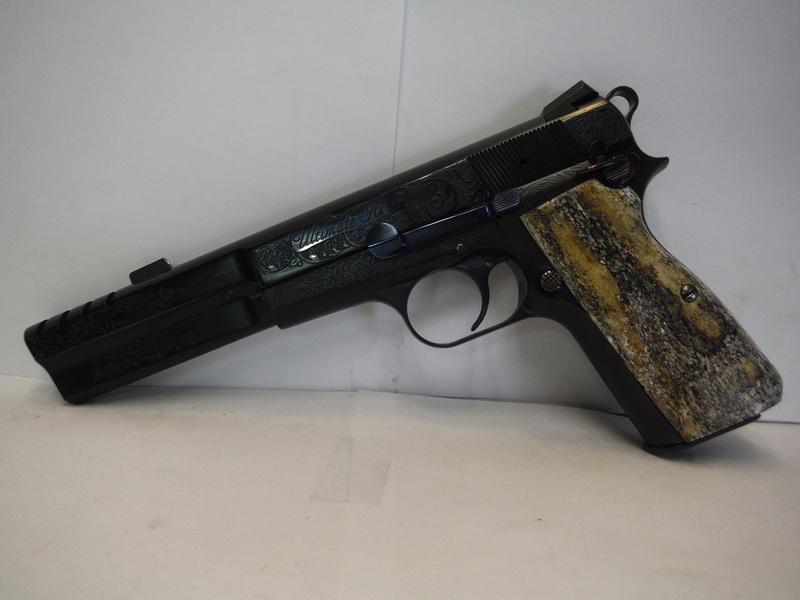 This is one of our Ultimate Back Up pistols and is full custom. It is also unusual in that you very seldom see a government model size 1911 with a lightweight alloy frame but this is one and perfect for all day carrying. It has a match grade 5" barrel, high polished stainless slide, satin alloy frame with contrasting satin Vapor Honed Black Chromex small parts. It has an extended slide release, extended safety, Novak night sights, custom beavertail, custom commander hammer, custom trigger, and a complete action job including ramping and polishing. The gun has a nice set of Goncalo Alves grips made and fit to it. A super smooth and accurate 1911. The Ultimate Back Up is normally $1795 but this beauty is sale priced at $1395 plus shipping. This is one of our very popular Ultimate Hi Powers. 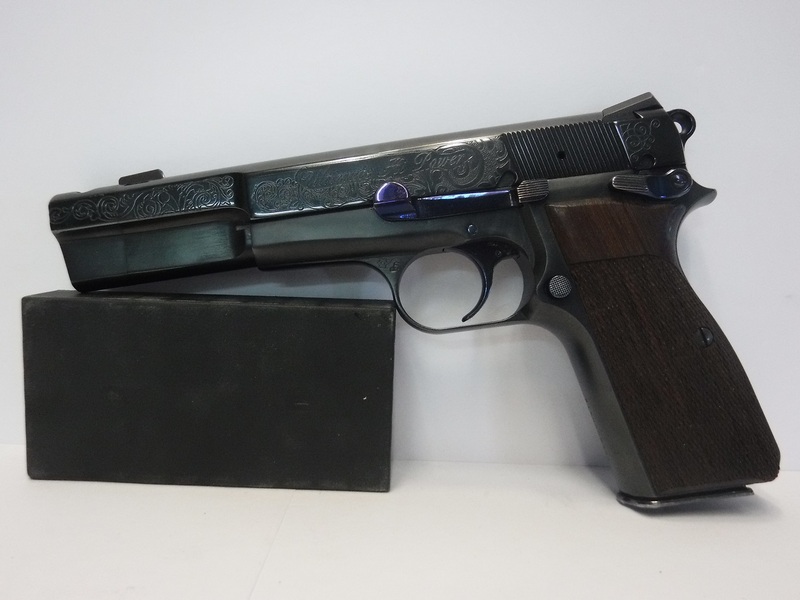 This 9mm beauty started out as a Belgium Browning Hi Power. It is one of over 50 that we bought from the Israeli Defense Force. We have completely revamped the gun with all new internals, ambi safety, match grade barrel, Novak night sights, custom grips, ramped, polished and fully accurized and fully engraved. It is finished in our deluxe Black Chromex finish with fire blue small parts. It has our own comp for a quicker second and third shot if needed. This beauty is normally $2195 but is sale priced at $1795 plus shipping. This is a very special 41 GNR Dan Wesson. The gun has $1000 worth of color case, $500 in full custom, made from scratch, Ivory Max grips, a full action job and the rechamber to 41 GNR, plus the price of the gun. That works out to a bit over $3800. Let's keep it at the low end of that and run the gun at $2695. I thought about taking it home with me, but it would just sit in the safe forever and I would rather one of you guys get it. The gun is priced at $2695 plus shipping. 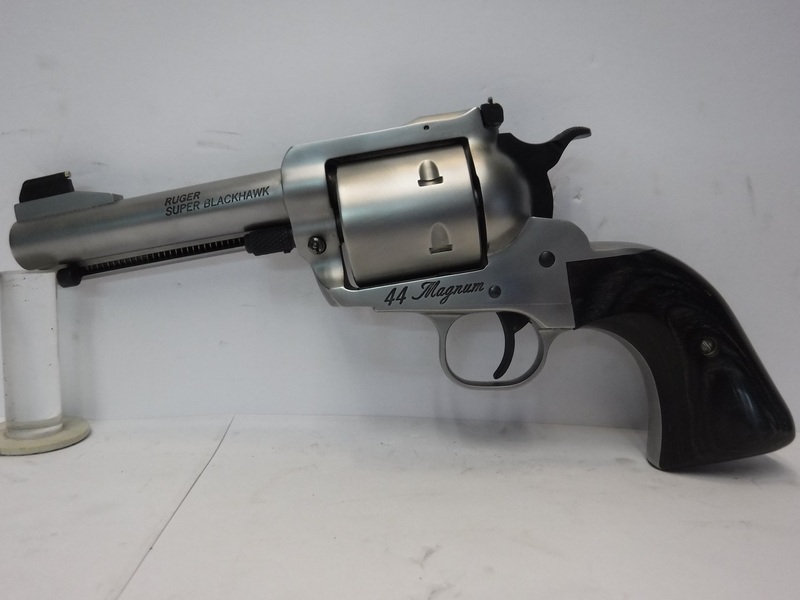 This is another of our special semi custom revolvers. Most of the features of a full custom gun but at a much lower price. This is a 4 5/8" 44 Special. Finished in our satin Vapor Honed stainless steel. It has contrasting fire blue small parts. It has had the Positive Performance package done to it and is super smooth. 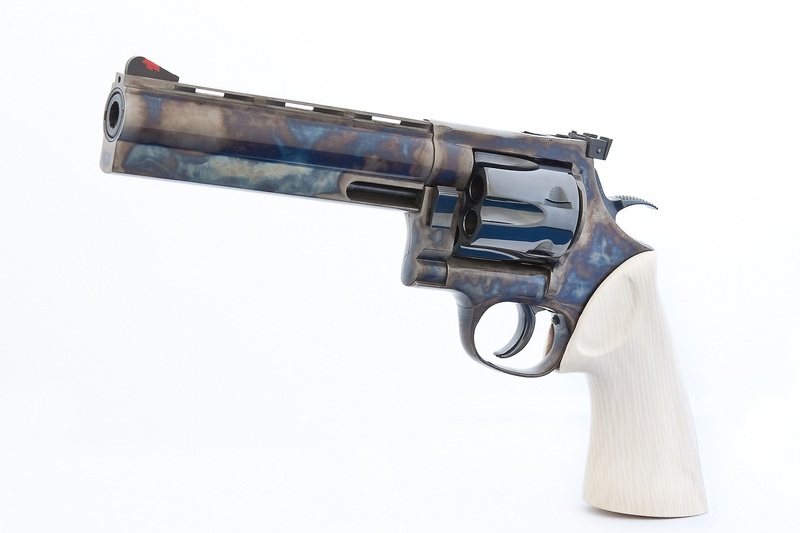 It has the Gunfighter Grip and a really nice set of blue laminated grips made and fit to it. All in all a really nice 44. This beauty is special sale priced at $1295 plus shipping.